The first We Shall Overcome took place over the weekend of October 2/3/4 2015 and comprised 250 gigs in 123 towns in 8 countries on 3 continents. It raised an estimated £125,000 of cash, food, clothes and bedding for those hardest hit by austerity. Joe explains how it came to happen. Jimmy was voicing his fears that society was changing irrevocably and that we were in danger of losing our humanity. The post was a part of my response to a perhaps inevitable result at the ballots. On an island riven by nationalist sentiment, anti-immigration propaganda, and an unprecedented and sustained hate campaign against those on welfare, the party most responsible for creating, feeding and fuelling these divisions clawed its way in. We faced five more years of class war from the top, and they were revelling in it. There were two possible reactions to it: to spend ANOTHER five years calling them names, or to do something POSITIVE about it. The question was what. Within two days we had managed to mobilise every left-leaning musician we knew and we had our weekend, October 2/3/4; and thanks to The Hurriers we had a logo and a name- WE SHALL OVERCOME. The remit is this: we put together a series of gigs all booked and run locally, but each flying the one banner nationally- We Shall Overcome. Rather than admission charges we asked for donations for local food banks and/or voluntary cash collections for local homeless shelters and soup kitchens. The gig could be anything, the majority were musical, but we had poetry, storytelling, comedy, cookery, traditional dance, DJ sets, karaoke, snooker competitions, art auctions, film nights and board game contests and people up and down Britain and Ireland coming together in the spirit of cooperation, all showing solidarity in the face of this state-inflicted misery they call austerity, and all in peaceful defiance of those who would use it as a weapon against society’s most vulnerable. and our idea went global, with events springing up in the US, Canada and Australia. Thousands of people made it happen with their hard work, dedication and desire to do something positive in the face of the politics of despair. This was a fight back, not with bricks and bottles, but a fight back with compassion, reclaiming that humanity Jimmy Reid feared we’d lose; a ground-up movement of ordinary people pooling their resources and doing anything in their power to help, to make a difference; but more than that, it was a gathering of the clans, a chance to build new alliances, forge new bonds, and move forward with renewed energy and conviction, full of fresh ideas- empowered. Make no mistake about it, this wasn’t about not going down without a fight, this was about not going down at all. Together, we SHALL overcome. “Thank you. First I’d like to dedicate this to Beryl T Peril who sadly lost her long battle with cancer a few days before We Shall Overcome, and who I know would have loved it….and who I know would have felt as awkward as I do about me standing here tonight. This one’s for you Sonja. Now Steve and myself had been involved in playing and organising benefits for food banks for a couple of years and I suggested marrying the two together- and We Shall Overcome was born. We basically just sent word out into the world hoping to get maybe 10 or 15 gigs on the same night and make a statement. But it kinda took off. By the time we reached our night it was a full weekend….a 9 day weekend…and instead of those 10 or 15 gigs we had 250….in 123 towns and cities…across 8 countries on 3 continents, and we estimate that we managed to raise a total of £125,000 worth of cash, food clothing and blankets for those at the sharp end of austerity. Now austerity doesn’t just mean a few Public Sector pay freezes and the fact that your local librarian is now a volunteer. Austerity drives people from their homes and leaves them shivering in shop doorways; austerity sanctions people on benefits leaving them penniless; austerity drives people into meaningless jobs earning poverty wages so they graft all week and STILL can’t pay the bills. This is the invisible face of the Cuts. Thousands of people not only shivering in shop doorways, but shivering in sleeping bags sat in armchairs in their own front rooms because they have had to make the awful choice between heating and eating, and in the sixth largest economy in the world that is not only shameful, to me it is unacceptable and THAT is the country We Shall Overcome was born into. As soon as I heard that word I knew we were winning. See you can give someone a MEAL and they can make it through the world, but give them HOPE and they’ll CHANGE it. Lastly we wanted to re-establish the link between live music and communities, and vice versa. For years now music and musicians have occupied this tiny, selfish little space where all that matters is money and fame, but music wasn’t born under a spotlight, it was born around campfires when someone suddenly realised they had a talent for telling stories in rhyme and setting them to tunes. They weren’t professionals, they worked in the fields or at the mills just like everyone else. This is the role I see musicians in today. We get in from work and out we go again, and we sing our stories, we make people laugh, we make people cry, we gather them together, we spread a message of hope and we do all we can in our own small ways to make the world a better place; not because there’s a reward there for us, but because that is what musicians DO, that is what we have ALWAYS done, and we should be damn proud to follow in that tradition. So from the Gang of Five- myself, Stephen Goodall, Matt Hill, Tony Peter Wright andJamie Bramwell; from Val Colvin, Steve White, Pete Yen, Pauline Town and all the HUNDREDS of people who made We Shall Overcome happen, I want to say a big THANK YOU. People did just that, and #WSO2016 ran from 1st to 9th October comprising 262 gigs in 114 towns and cities raising a similar amount of help. 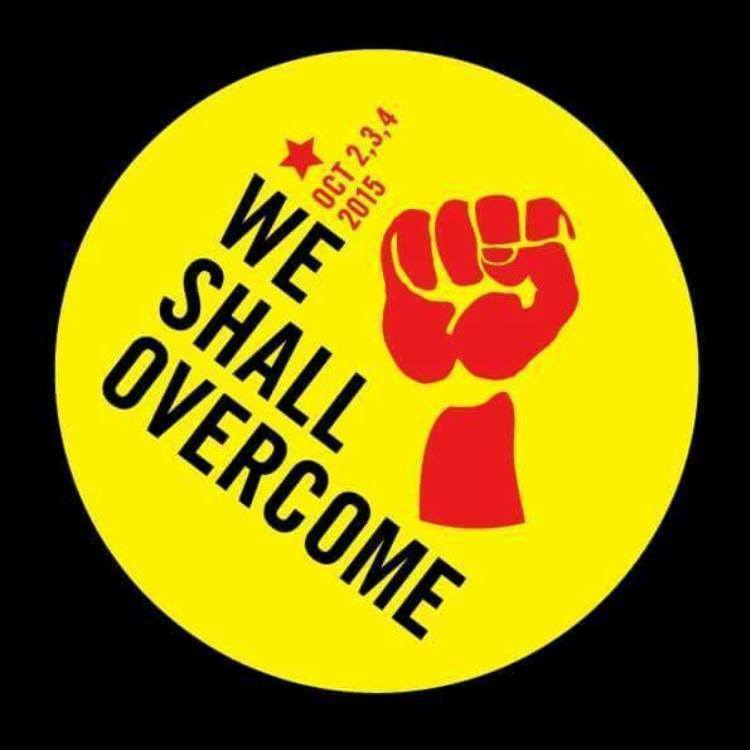 In total, We Shall Overcome has run more than 900 gigs helping to raise an estimated £420,000 worth of food, cash, clothing, bedding, furniture and electrical goods. As Universal Credit is rolled out and poverty in our communities gets worse still, we will be there fighting back for as long as it takes. By the end of 2019 WSO will top 1000 gigs and more than half a million pounds in help for the hardest hit in society.